From high tech trains and science museums to arcades and Akihabara, Tokyo is a nerd haven. One of the most prominent ways geekery manifests itself in Japan’s capital city though, surprisingly, is in food. During my trip to the Kanto region this summer during Japan’s Obon holiday, I visited an embarrassing number of cafés. But Tokyo is a prime nerd spot, and I wasn’t about to pass up the opportunity to eat at every themed café and restaurant I could get my taste buds on. Read on for my list of the nerdiest cafés in Tokyo! The Alice in Wonderland aesthetic has gained tremendous popularity in Japan in recent years, an obsession which is apparent in clothing styles, accessories, and yes, even restaurants. The Alice Fantasy Restaurant (which in my opinion functions more like a café) is a favorite among local and visiting fans alike, and offers a cute, storybook-like atmosphere perfect for dates, parties, or even just tea with friends (don’t forget to move down and get a new cup!). 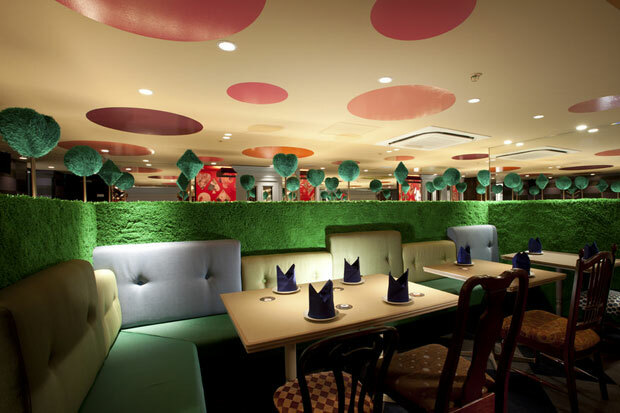 Guests are transported into a world of fantasy at the Alice Fantasy Restaurant. Will you sit in the maze of roses, or at a table at the Mad Hatter’s tea party? There are plenty of diverse seating options, all of which are immersive and magical. But don’t expect to walk into the Disney movie, as these restaurants are modeled more closely after the books of Lewis Carroll than after Walt’s animated retelling. The atmosphere does have a sense of Disney charm though, as classic and modern Disney songs frequently play in the background. 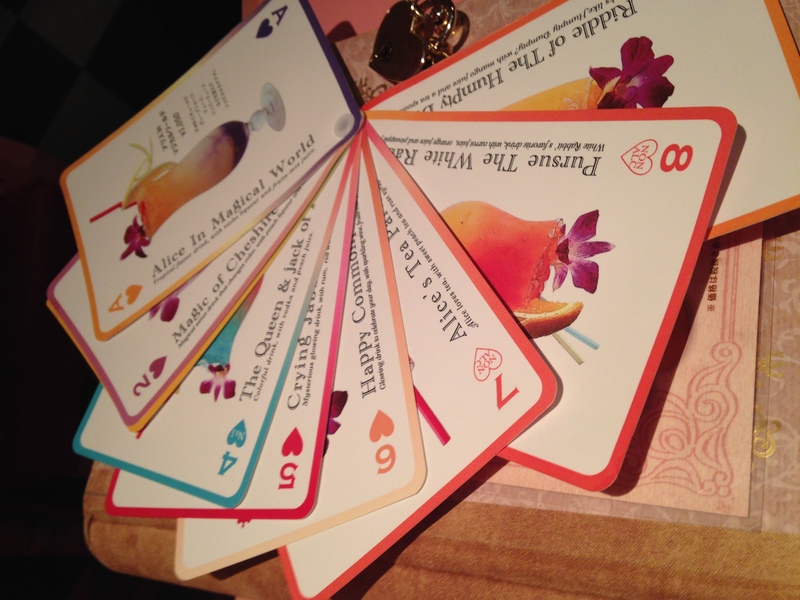 A creative drink menu in the form of playing cards. The food menu is a large storybook. 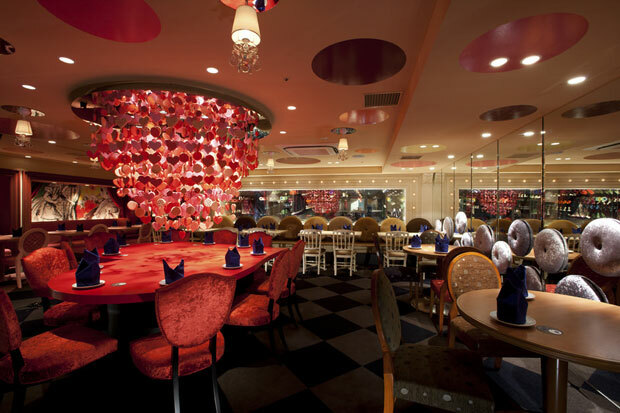 The Alice Fantasy Restaurant has eight locations spread around Tokyo and even two locations in Osaka, each with a slightly different theme and decor. Beware of a 500 yen cover charge per guest as well as minimum orders (one drink and food item per guest). Reservations are highly recommended, especially during peak travel seasons. At the location I visited, I was even given a complimentary small appetizer with the tag “Eat Me,” and a bag of tea labeled “Drink Me” that I took home (it was delicious!). The Ghibli Museum in Mitaka, a small city west of Tokyo, houses displays of Studio Ghibli’s finest animated films, and is a worthwhile visit in and of itself (if you can manage to get tickets). If you do find yourself under the peaceful canopy of trees that surrounds the creative yet quaint museum, you might want to consider lunch at the Straw Hat Café, the name of which is inspired by the straw hat worn by little Mei in the film My Neighbor Totoro. 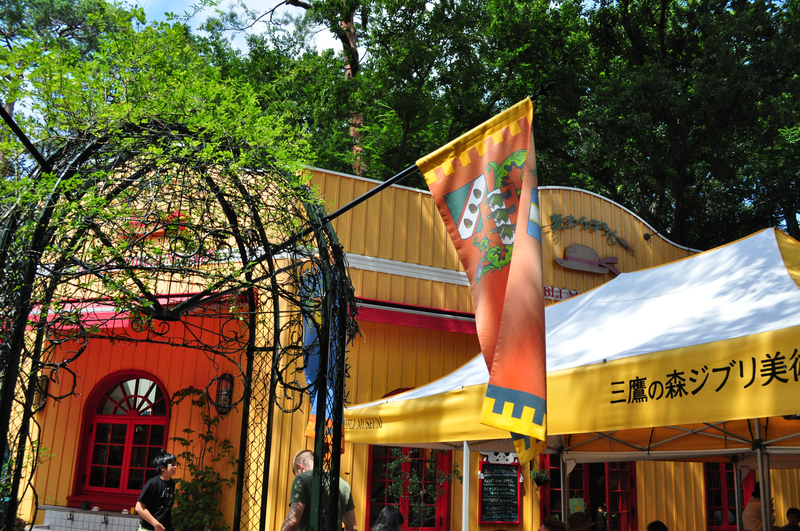 Relax at the Straw Hat Café after exploring the Ghibli Art Museum. Offering a menu of relatively simple food made from mostly organic ingredients, recommended items include the jumbo pork cutlet sandwich, the fruit sandwich, and the strawberry shortcake. The wait time for the café is usually long, considering the museum’s popularity. Don’t feel like waiting? There’s also a to-go window at which you can order hot dogs, gelato, or barley tea. 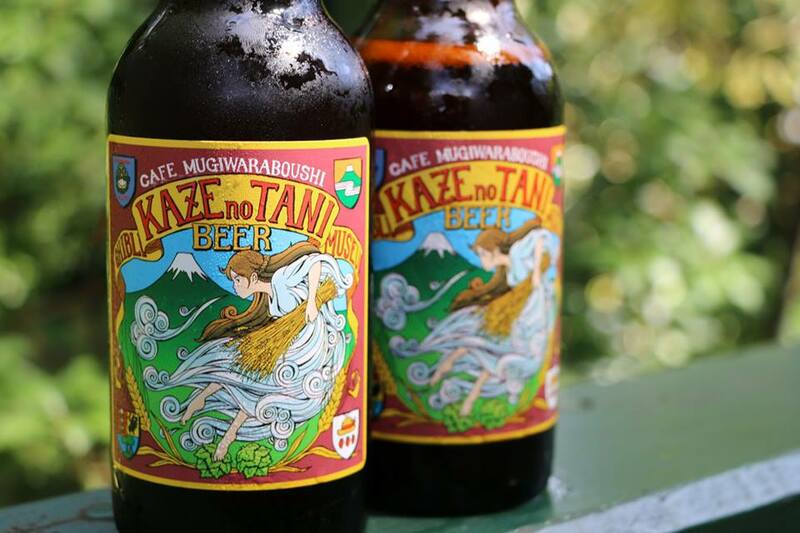 But if you don’t have anywhere to be, take a seat on the shady terrace and sip a tasty and exclusive Ghibli beer inspired by Nausicaä of the Valley of the Wind. Feel free to keep the bottle as a souvenir! If you’re familiar with the manga or anime Shirokuma Café, you know that the series is centered around a café in Tokyo run by a talking polar bear, who serves food and drinks to humans as well as his animal friends. And yes, you guessed it, this café actually exists, and is officially licensed. And although it’s not actually filled with talking animals, the stuffed panda and penguin sitting at the counter are pretty convincing. Step into the world of Shirokuma Cafe when you visit this adorable eatery in a quieter part of Tokyo. 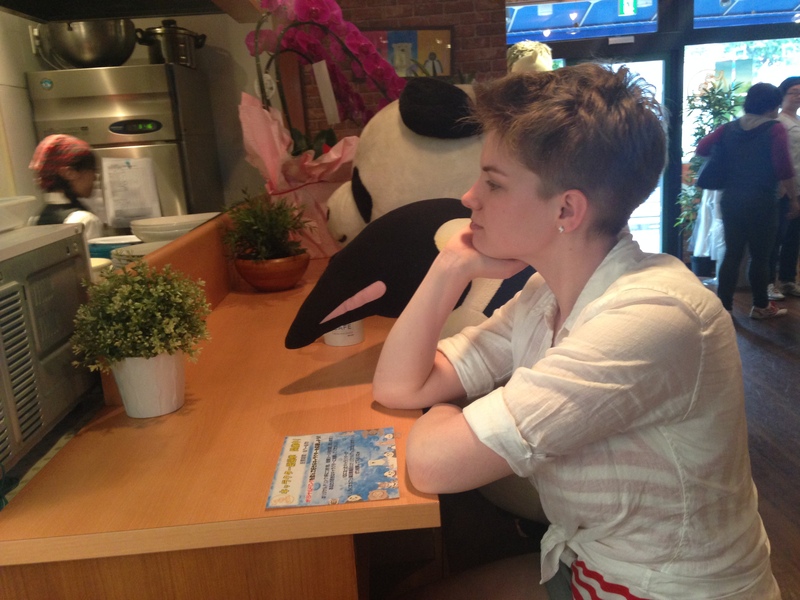 Patrons of the Polar Bear’s Café can order from a wide range of series-inspired food and drinks, including items such as a Penguin-san seafood plate and a Panda-kun matcha latte. 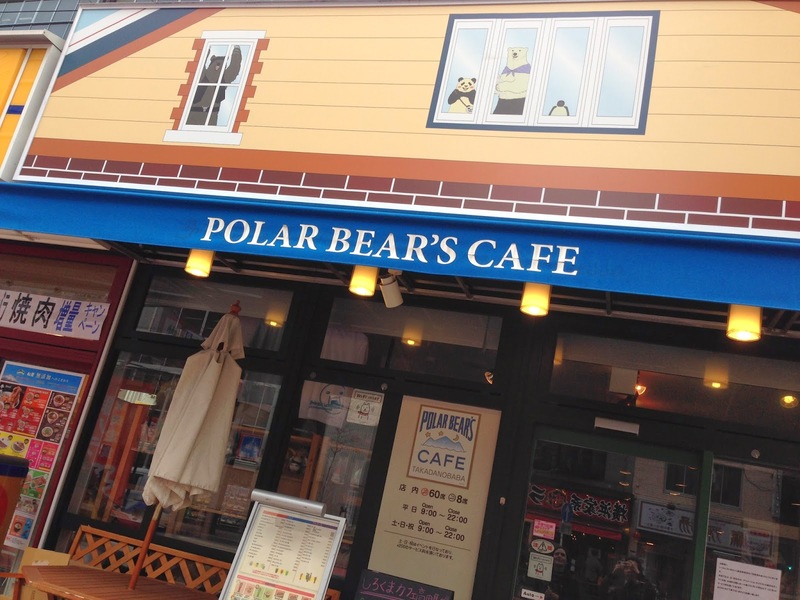 There’s also a small shop at the front of the café that sells official merchandise, and the staff are more than willing to take a picture of you at the counter with Polar Bear’s animal friends. And, if you order a food and drink set, your order comes with a free souvenir coaster! Having a drink with Panda-kun and Penguin-san! Located on the top floor of the Tokyu Hands flagship store in Shibuya, the 恐竜カフェ, or “Dinosaur Café,” was opened in July 2014. Whether you’re looking for a meal, a snack between shopping sprees, or just some tasty fossil-themed coffee, there’s something here for you. 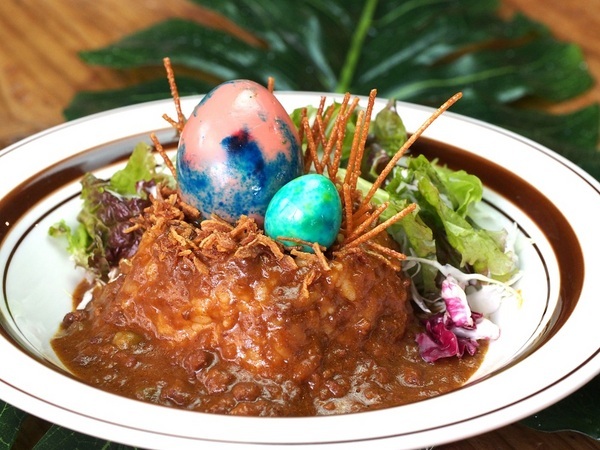 Hot coffee and iced cocoa are decorated with the dinosaur design of your choice, and if you’re feeling hungry, you might want to try the “Dinosaur Nest Curry.” There are both indoor and covered outdoor areas to sit, but like most things in Japan, the café isn’t huge, so expect to wait for a seat if you go during a busy time. 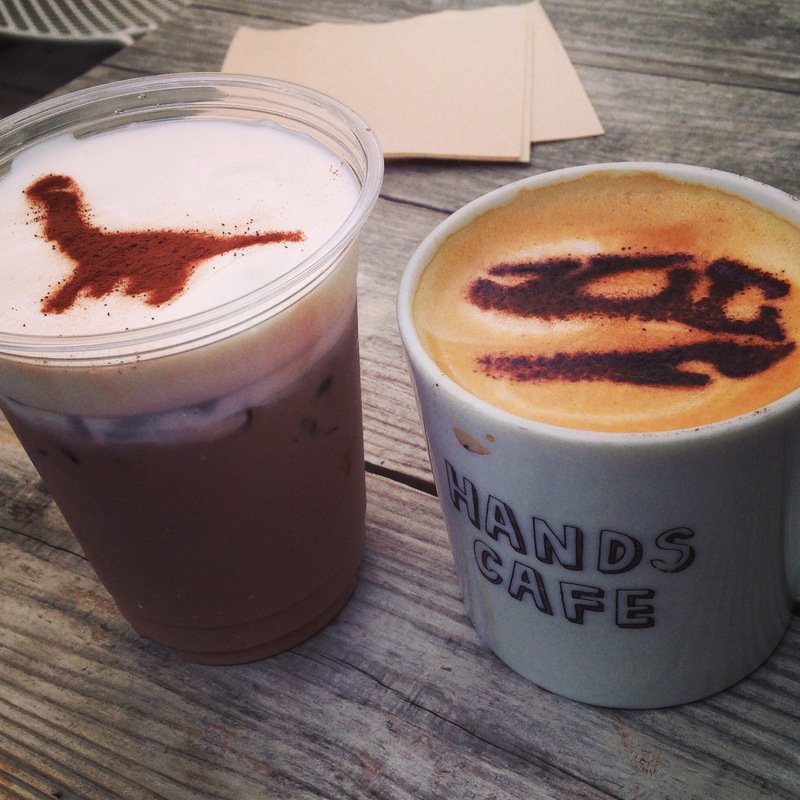 Powdered cocoa dinosaur designs adorn the drinks at the 恐竜カフェ. The café is accompanied by a gift shop that sells mostly dinosaur and science-related goods, and there are even “Dinosaur Shop” licensed goods that make the perfect gift for your dinosaur-loving friend (aka me). Feel free to snap a picture of a fossil statue or pose with a raptor in a lab coat as you wait for your order. As seems to be the case with many cafés in Japan, the Dinosaur Café is not a permanent installment, and runs only until September 15, 2014. However, the Tokyu Hands Café regularly collaborates with businesses in the area, so be on the lookout for the next themed café they host! 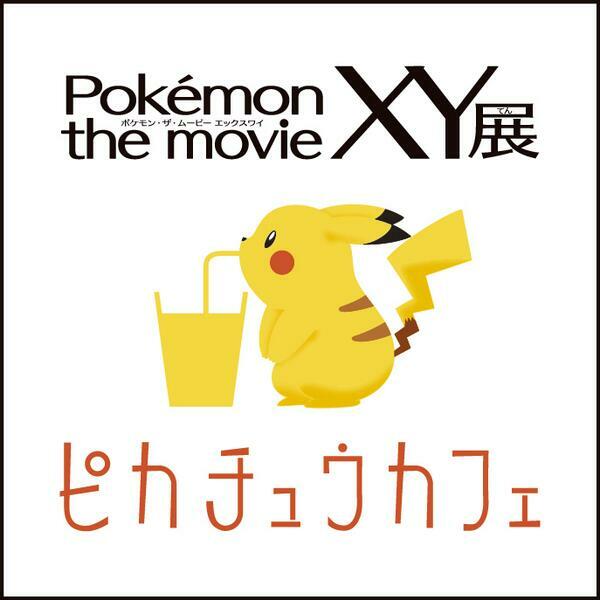 A temporary installment on Roppongi Hills’s 52nd floor, the Pikachu Café is part of a larger Pokémon XY exhibit that runs from August through September. 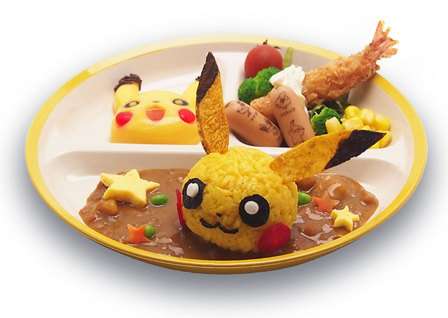 Patrons can choose from several Pokémon themed dishes such as Pikachu curry, Pikachu pork buns, and a Pikachu Thunder Parfait. There’s even alcohol available. Wait times can be long, but the adorable meals are worth it and don’t taste half bad. Take the escalator down one floor and you’ll find yourself in a limited Pokémon store that resembles one of Japan’s eight Pokémon Centers. This eatery and shop won’t be open for long though, so get some Pikachu curry and exclusive goods while you can! When not decked out like a Pokémon stadium, the café is normally the classy Mado Lounge Spice, which still offers an incredible view of the Tokyo skyline at any time of year. 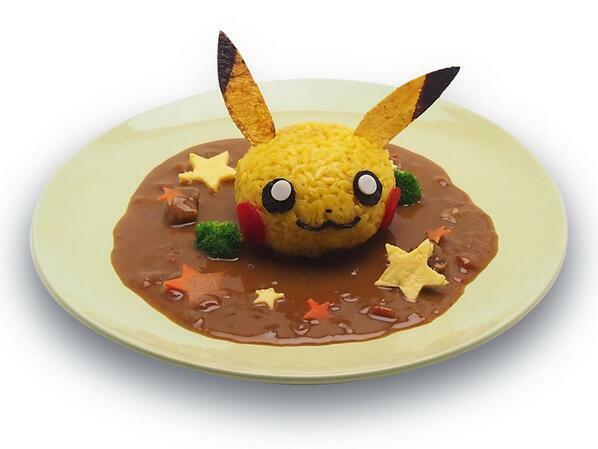 I had the Pikachu Curry. It was delicious, but almost too cute to eat! Probably the most famous nerd café in Tokyo, the Gundam Café has been a major draw for fans of the massively popular Gundam series for years. The café might as well be one for Gundam pilots, with its futuristic yet simple decor of white furniture and large glass windows. Guests can choose from a large menu of Gundam-inspired meals that range from Haro toast to Kira Yamato hayashi rice. Equipped with a full bar, the drink menu in and of itself is a sight to behold, with its various themed mixed drinks and cocktails. The café even serves decent coffee, available in several forms. There’s a gift shop as well, where you can buy your friends (who aren’t as lucky as you) a small souvenir. The Gundam Café in the heart of Akihabara. 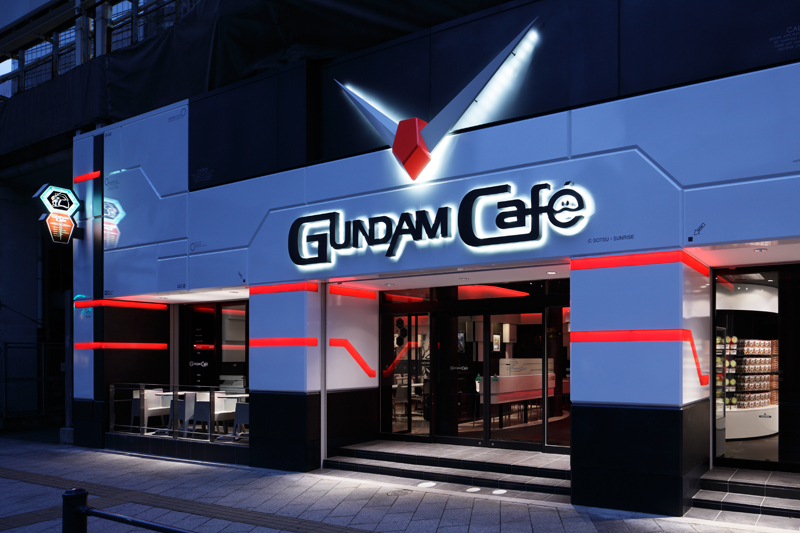 There are a few different Gundam Café locations in Tokyo, but the flagship café is located in the heart of Akihabara, arguably the nerd capital of the world. Wait times are notoriously long, so make sure you get in line early if you don’t want to spend your day waiting for your chance to taste the café’s popular red bean-filled Gunpla-Yaki treat. 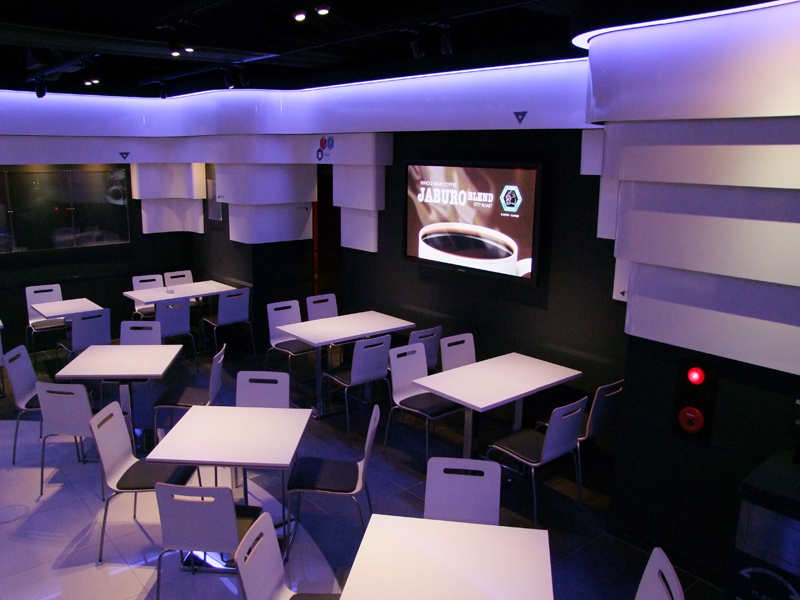 The café features a relatively simple but futuristic interior. Have you been to any nerdy cafés in Tokyo that didn’t make it on this list? What was it like? We want to know! Share your experiences in the comments!